Muddy hiking boots are removed and left in the entryway of Refugios, and Crocs are provided for inside wear. We awoke Sunday morning (day 5) to more clear blue skies, and after a 6:30 am breakfast packed our things and started our trek. 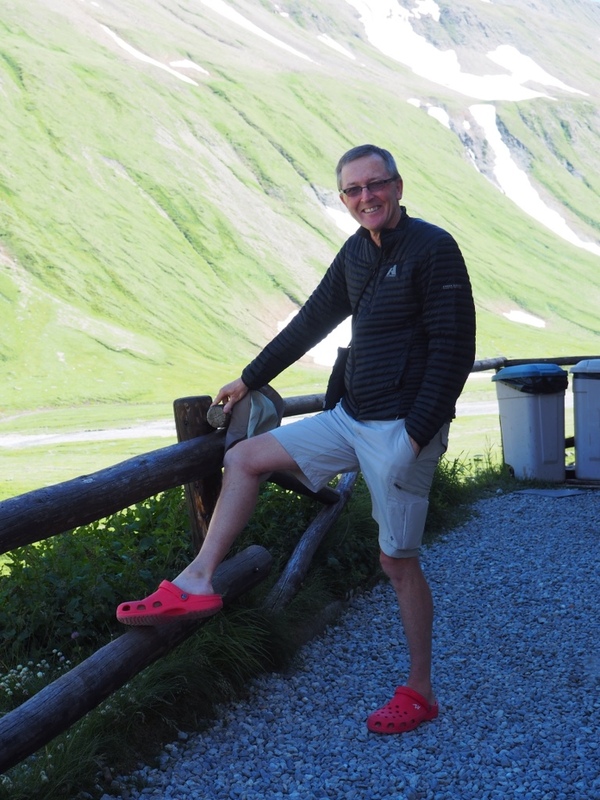 The hike down from Refugio Elisabetta eventually leveled out onto a wide pathway of relatively easy walking…a welcome relief to the relentless ups and downs of the last few days. We were pretty sure the easy walking would not last, and of course it didn't. We soon found ourselves headed up and out of the area known as Vallée des Glaciers. 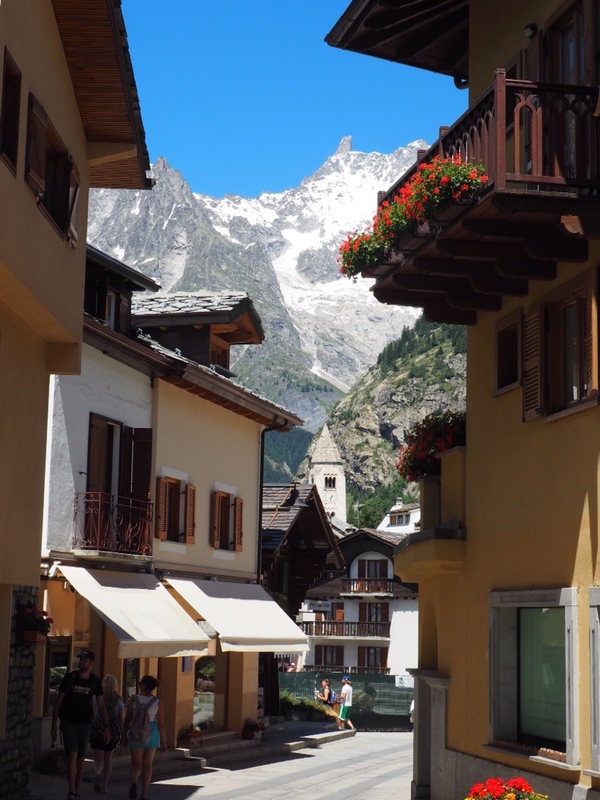 Anticipating two nights and a day of rest in the village of Courmayeur, we figured it wouldn't be too tough. We soon found ourselves high above the valley floor with no end in sight. 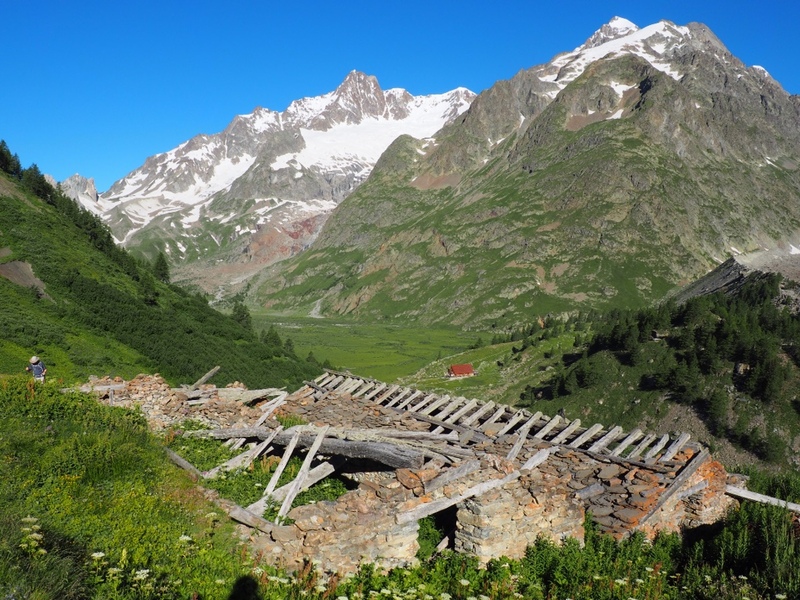 Our path took us by several piles of rubble, described in our guidebook as abandoned buildings. 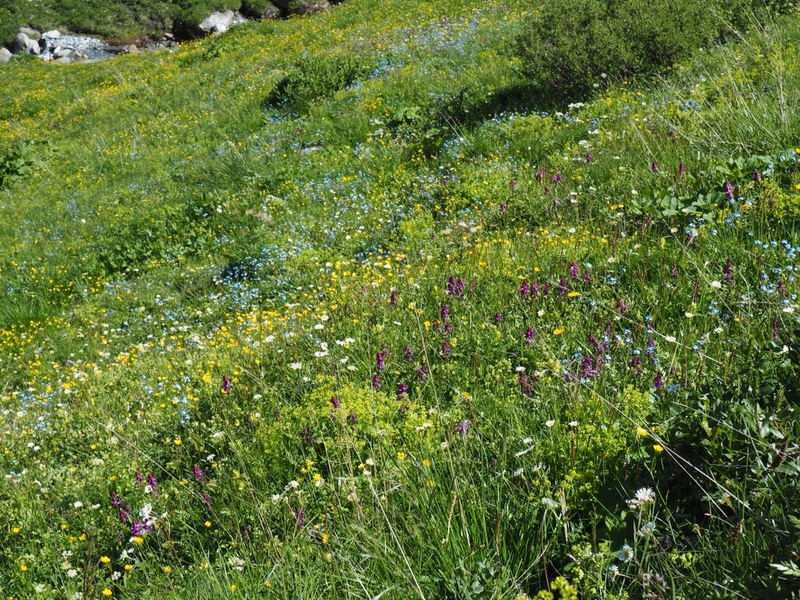 The hillsides are covered with the most amazing display of wild flowers I have ever seen. The camera doesn't do them justice. 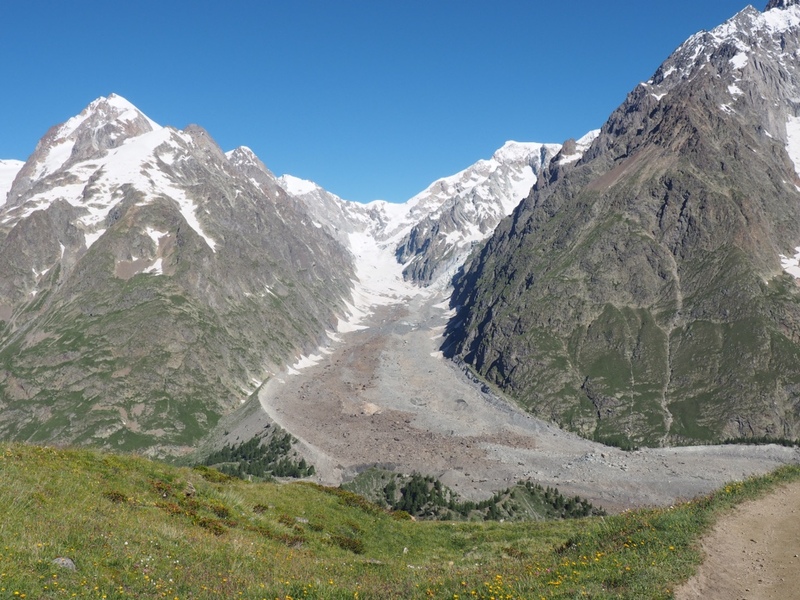 From across the valley we can see Glacier du Miage, which must have once reached the valley floor. 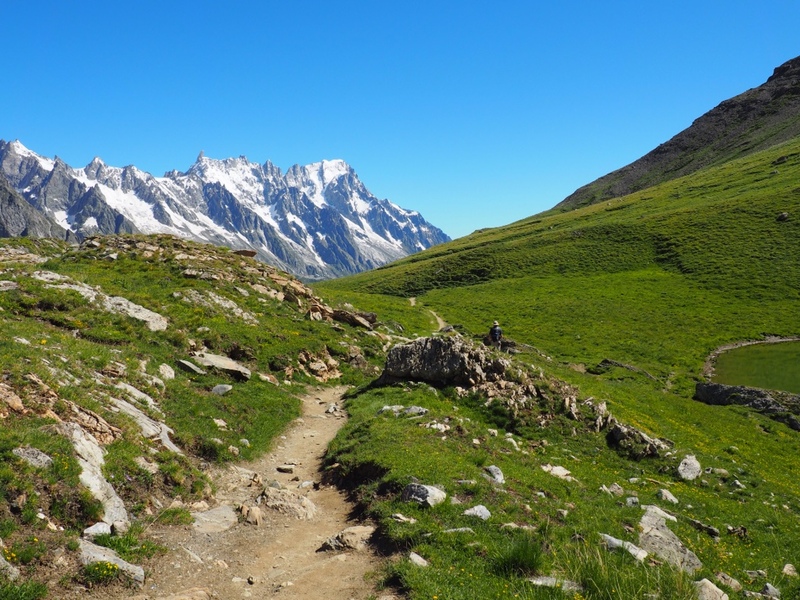 Onward we trekked, hoping to catch our first glimpse of Courmayeur around the next bend. 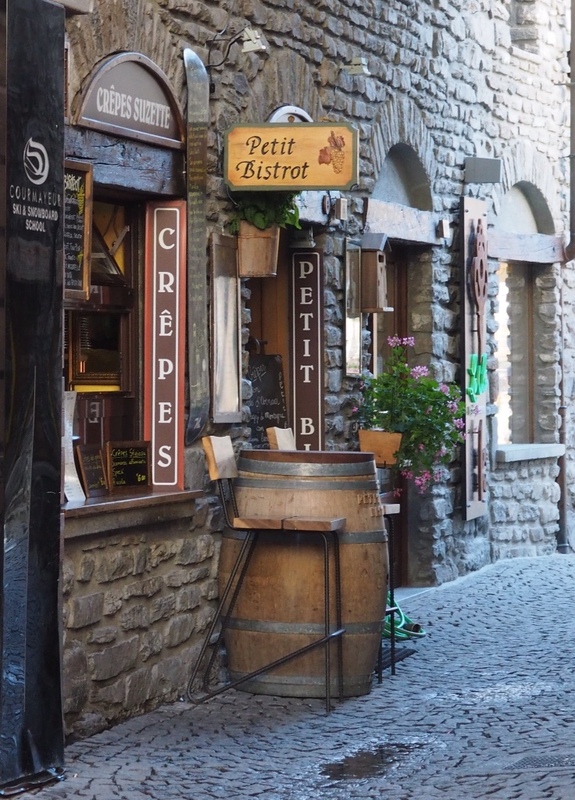 The village of Courmayeur is a charming place to kick back for a much needed rest. Our itinerary called for an eleven mile day. After what seemed like at least that, if not more, we arrived at another Refugio situated on a ridge above our destination. Trail markers pointed us steeply downhill for what was estimated to be another two hours of walking. Ski lifts to the rescue. We purchased our tickets and hopped on the lift down. Best purchase of the trip! 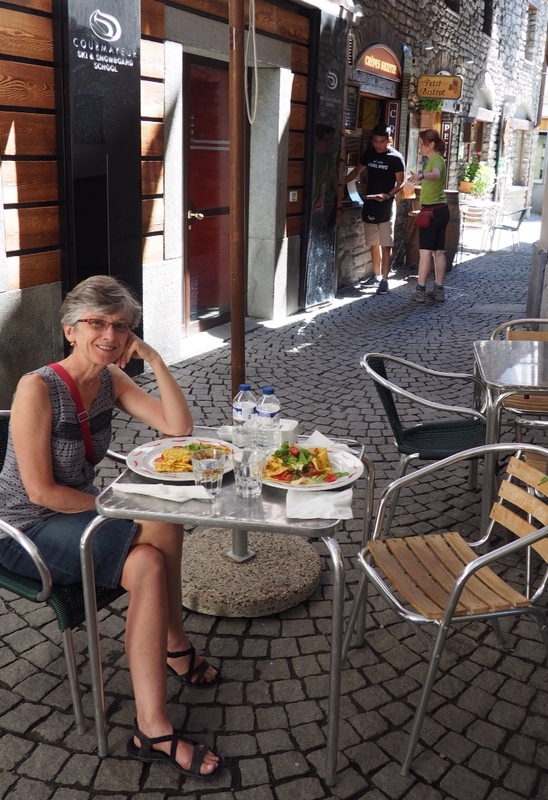 We discovered this cute little lunch spot that served delicious crepes. And they had outdoor seating!